Introduction to numerous animal models used to study diverse aspects of drug use. Chapter 1. What is Addiction? George F. Koob, Ph.D., received his Bachelor of Science degree from Pennsylvania State University and his Ph.D. in Behavioral Physiology from The Johns Hopkins University. He was recently appointed (in 2014) as Director of the National Institute on Alcohol Abuse and Alcoholism (currently on a leave of absence as Professor at The Scripps Research Institute, Adjunct Professor in the Departments of Psychology and Psychiatry at the University of California San Diego, and Adjunct Professor in the Skaggs School of Pharmacy and Pharmaceutical Sciences at the University of California San Diego). As an authority on drug addiction and stress, he has contributed to our understanding of the neurocircuitry associated with the acute reinforcing effects of drugs of abuse and the neuroadaptations of the reward and stress circuits associated with the transition to dependence. Dr. Koob has published over 780 scientific papers. 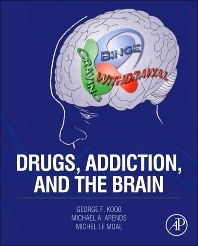 In collaboration with Dr. Michel Le Moal, he wrote the renowned book Neurobiology of Addiction (Elsevier, 2006). He was previously Director of the NIAAA Alcohol Research Center at The Scripps Research Institute, Consortium Coordinator for NIAAA's multi-center Integrative Neuroscience Initiative on Alcoholism, and Co-Director of the Pearson Center for Alcoholism and Addiction Research. He has trained 75 postdoctoral fellows and 11 predoctoral fellows. He is currently Editor-in-Chief of the journal Pharmacology Biochemistry and Behavior and Senior Editor for Journal of Addiction Medicine. Dr. Koob taught for 35 years in the Psychology Department at the University of California San Diego, including courses such as Drugs Addiction and Mental Disorders and Impulse Control Disorders, courses that regularly matriculated 400-500 students each. He also taught Contemporary Topics in Central Nervous System Pharmacology at the Skaggs School of Pharmacy and Pharmaceutical Sciences at UCSD for 9 years. Dr. Koob's research interests have been directed at the neurobiology of emotion, with a focus on the theoretical constructs of reward and stress. He has made contributions to our understanding of the anatomical connections of the emotional systems and the neurochemistry of emotional function. Dr. Koob has identified afferent and efferent connections of the basal forebrain (extended amygdala) in the region of the nucleus accumbens, bed nucleus of the stria terminalis, and central nucleus of the amygdala in motor activation, reinforcement mechanisms, behavioral responses to stress, drug self-administration, and the neuroadaptation associated with drug dependence. Dr. Koob also is one of the world's authorities on the neurobiology of drug addiction. He has contributed to our understanding of the neurocircuitry associated with the acute reinforcing effects of drugs of abuse and more recently on the neuroadaptations of these reward circuits associated with the transition to dependence. He has validated key animal models for dependence associated with drugs of abuse and has begun to explore a key role of anti-reward systems in the development of dependence. Dr. Koob's work with the neurobiology of stress includes the characterization of behavioral functions in the central nervous system for catecholamines, opioid peptides, and corticotropin-releasing factor. Corticotropin-releasing factor, in addition to its classical hormonal functions in the hypothalamic-pituitary-adrenal axis, is also located in extrahypothalamic brain structures and may have an important role in brain emotional function. Recent use of specific corticotropin-releasing factor antagonists suggests that endogenous brain corticotropin-releasing factor may be involved in specific behavioral responses to stress, the psychopathology of anxiety and affective disorders, and drug addiction. Michael A. Arends received his Bachelor of Science degree from the University of California, San Diego. He is currently a Senior Research Assistant in the Committee on the Neurobiology of Addictive Disorders at The Scripps Research Institute and has worked in the field of the neurobiology of drug addiction for 20 years. He is Managing Editor for the journals Pharmacology Biochemistry and Behavior and Journal of Addiction Medicine. He has been acknowledged for his editorial and research assistance in over 450 scientific publications, including books, book chapters, and journal articles. Michel Le Moal, M.D., is Professor Emeritus of Neuroscience at the University of Bordeaux, France. He graduated in Medicine (1962) in Philosophy-Sociology and Natural Science and then Neurology (1967) and Psychiatry (1968). He completed a Doctoral in Science at the University of Bordeaux in 1974. In parallel with his academic life in Bordeaux, he spent time as an Associate Researcher and Professor at Caltech (1974) and at The Salk Institute and The Scripps Research Institute. At both institutions, he worked on dopamine neuron electrophysiology and investigated the roles of brain CRF and dopamine systems in behavior and drug addiction. He research interests concern behavior and adaptive processes, their biological foundations, and experimental psychopathology, a discipline he promoted. The concept of individual vulnerability to behavioral pathologies has been at the center of his working hypothesis. Dr. Le Moal has been the founder and director of several research laboratories at the Centre National de la Recherche Scientifique (CNRS) and Institut National de la Sante et de la Recherche Medicale and finally the Magendie Institute for Neuroscience and Biological Psychiatry in Bordeaux, France. He is an elected Fellow of the French National Academy of Sciences. biased view on drugs (story about marijuana leading to cocaine addiction therefore indirectly stating marijuana as a gateway drug which is up to today not proven). Interesting facts about the history of drugs but more focus could have been put into making the neuropsychological parts more understandable.